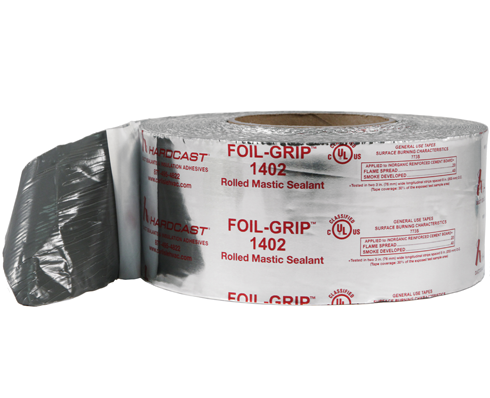 Foil-Grip 1402 is a pressure sensitive, 40-year cycle, duct joint and general purpose rolled sealant. Foil-Grip 1402 provides an instant water resistant grip to most surfaces including sheet metal, duct board, flex board, PVC coated duct, and duct wrap vapor barriers. Foil-Grip 1402 is suitable for sub-grade application on PVC coated duct. • Tensile Strength: 955 psi avg. • Sealant Material: Modified Butyl. • LEED compliant SCAQMD Rule 1168. Excellent product. Better than sprays.